Mikhail Gantvarg is one of the outstanding contemporary musicians, a successor of the traditions of the famous Saint Petersburg school. His name is well-known to those who value the true high classical art both in Russia and in other countries. Born in Leningrad in 1947. Graduate of the Leningrad Conservatory. In 1972, graduated from the graduate school and worked as a concertmaster of the Leningrad Philharmonic Symphony Orchestra. In 1967, took part in the international contest named after N. Paganini in Italy and became an award-winner of that prestigious competition. Since then, the artist has become a frequent tour performer. He performed in the US, Germany, Italy, Hungary, Czechoslovakia and other countries. Versatile and highly professional programs by Mikhail Gantvarg and the virtuosity of his performance, along with original interpretation of various musical forms have been highly appraised by the audiences and musical critics. In 1987, Mikhail Gantvarg has established a unique string collective, “Saint Petersburg Soloists” String Ensemble. He has dedicated a lot of effort to the selection of the repertoire, careful rehearsal of each piece and preservation of the legacy of the Saint Petersburg school of violinists. Each program by the collective has become a small masterpiece of the performing art. The range of the well-known band comprises international classics of the 17th-20th centuries and pieces by A. Schnittke, D. Shostakovich and S. Prokofiev. The maitre gets boldly engaged in the creative experiments and seeks new forms. A bright expression of that are the large-scale pieces by G.B. Pergolesi, J.S. Bach and W.A. Mozart, where Mikhail Gantvarg has proved himself also as a talented conductor. As a soloist, he performs at the largest concert halls of Saint Petersburg: Grand and Minor Halls of the Philharmonic Society, Academic Capella, Smolny Cathedral, Beloselsky-Belozersky Palace, the halls at the palaces of Peterhof, Pushkin and Pavlovsk; in Moscow, at the Grand Hall of the Conservatory. He gives concerts on tour through the cities of the Far East and Russia’s “Golden Ring,” as well as in Kazakhstan, Azerbaijan, Ukraine and Estonia. He performs with great success in the US, Spain, Germany, France, Italy, Yugoslavia, Finland, Sweden, Luxembourg and other countries. The maitre has recorded about 40 CDs in cooperation with the Russian and international record companies. They feature all of Mozart’s violin and piano concertos, instrumental cycles by А. Vivaldi: Harmonic Inspirations, Whims and the Four Seasons and concertos for violin with orchestra by D. Shostakovich, J. Sibelius, J. Haydn and J.S. Bach. Takes part in the international festivals in the Canary Islands, at the Bodensee lake (Germany), in the Russia Days in San Diego (US), Turku (Finland), Orebro (Sweden), Eisterreich (Luxembourg), etc. Mikhail Gantvarg has been specially invited to take part in opening of a big modern concert hall in Saragossa (Spain); took part in the opening ceremony of the Munich Philharmonic Concert Hall. Mikhail Gantvarg has the titles of Distinguished Artist of the Russian Federation (awarded 1991) and People’s Artist of the Russian Federation (awarded 2004). 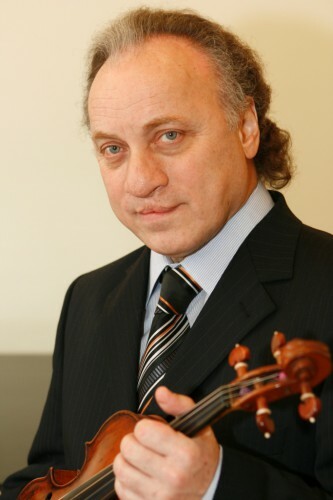 Since 2007, Head of the Violin and Viola Department at the Saint Petersburg Conservatory. From 2011 to 2015, rector of Saint Petersburg Conservatory.